Archaeologists in Saudi Arabia have discovered a series of rock reliefs dating back some 2,000 years. The life-sized sculptures show realistic impressions of several animals, though they have been badly damaged by years of erosion and rough treatment by humans. Researchers from France’s Centre Nationnal de la Recherche Scientifique (CNRS) and the Saudi Commission for Tourism and National Heritage surveyed the site during three brief visits in March 2016 and March 2017. The resulting paper, published today in the science journal Antiquity, details about a dozen reliefs carved into the rock. Called the “Camel Site,” it’s the first discovery of realistic, life-sized camels and horses carved in low- and high-relief in the Arabian Peninsula. Indeed, reliefs of any kind are rare in Saudi Arabia. The sandstone formations are easy to carve, but they’re prone to erosion. Human activity around the three rocky spurs haven’t helped things, either. In addition to learning more about these reliefs, the study was an effort to, in the words of the researchers, “generate awareness of endangered cultural heritage and to ensure the rapid preservation of the site by the Saudi state.” The Camel Site is currently enclosed within a private property, and in addition to erosion, has suffered considerable damage from bulldozers, the illicit removal of blocks, and vandalism. Despite the poor shape of the reliefs, the researchers, led by Guillaume Charloux and Hussain al-Khalifah, were able to identify around a dozen reliefs representing camels and horses. The animals were shown without harnesses. One particularly interesting scene shows an Arabian one-humped camel (a dromedary) meeting a donkey, the latter of which was rarely (if ever) represented in rock art. The site is also distinct in terms of the quality and the technical proficiency of the artist or artists. Art found in other Middle Eastern regions (including Jordan) tend to consist of basic engravings of camels without relief. The artists who carved these were skilled—and they likely came from afar. This part of northwest Saudi Arabia, Jawf Province, was as hostile 2,000 years ago as it is today. Human habitation is next to impossible, and the closest water well isn’t available for miles. So why did these ancient artists take the time and effort (not to mention all the equipment!) to carve these sculptures in the middle of nowhere? As the authors of the new study note, the outcrop is located near a former caravan route. The sculptures could have been used as a boundary marker, or as a place where travelers could rest and/or worship. Whatever the reason, the location was important enough at the time to warrant such detailed attention. 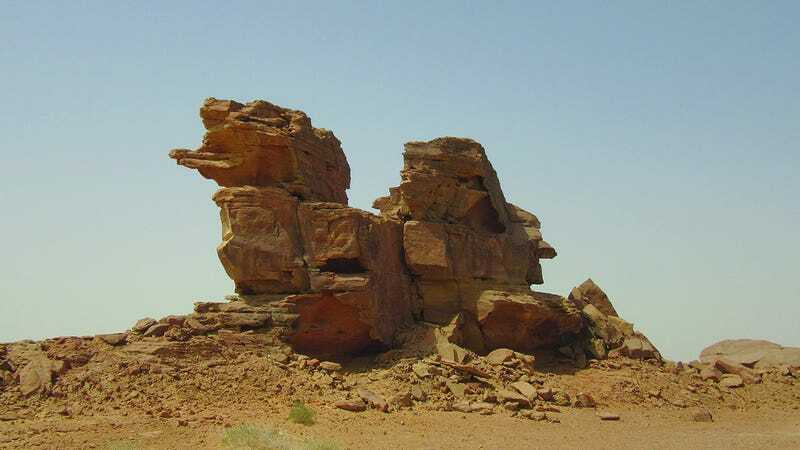 As rough as these sculptures look today, they would’ve been a welcome and striking sight for weary travelers making their trek across the desert.